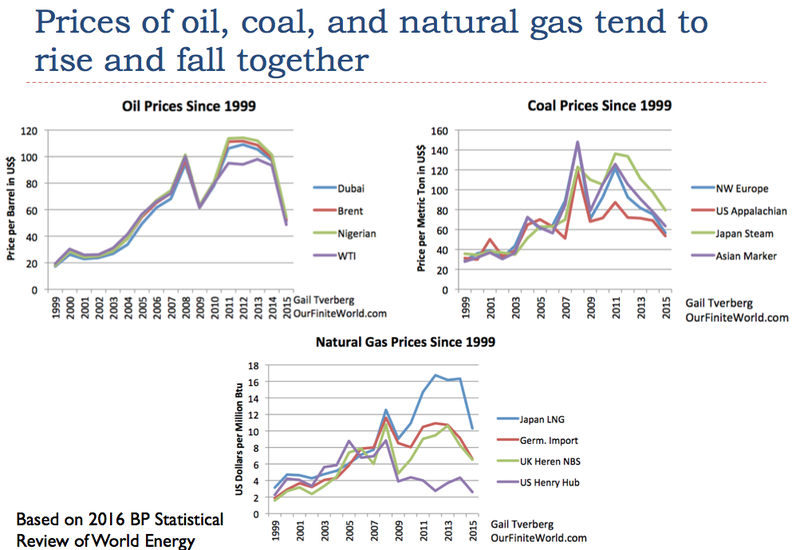 Gail ("the Actuary") Tverberg, a major contributor to The Oil Drum blog a few years ago, presents the thermoeconomic analysis of global economy, especially changes since late 2014, as global CO2 production and coal production started to decline Prices paid for oil and natural gas also plummeted suddenly. Reduction in coal use gets a smiley-face, but it also implies the sputtering of the "Chinese-growth-engine", which purportedly pulled the world out of "the great recession". Market prices for oil and natural gas are below the cost of pumping those fuels, which can only be sustained while financial reserves persist. They have been drawn-down hard since mid 2015. The excess of supply, compared to economic demand, of oil and gas, is holding prices down, but economy is not growing much, if any, so economy can be expected to contract sharply if prices rise to maintain production. We get a jagged downward trend in both economic activity, and supply of fuels to drive production, transportation, construction/repair, heating/cooling and large-scale agriculture. Cheap borrowing has reached the end of it's rope with interest rates at zero for much of 2015-2016. The process by which interest rates are now forced to rise is also explained. 10 of 11 US aircraft carriers are lined up at dock now, projecting power nowhere... Paul Craig Roberts supplies context. Thanks Eleni. "According to what I have been told by former(?) intelligence officers, the aircraft carriers are in dock so that their copper wiring can be replaced by fiber optics. Apparently, the Russians have the capability to shut down the operating systems of our ships and aircraft that are copper wired. In behalf of this conclusion, there were news reports that a missile ship Washington sent to impress the Russian naval base in Crimea had all its systems shut down by the overflight of one Russian jet. According to another news report, two Israeli US jet fighters were sent to express disobdience to Russia’s controlled airspace in Syria. The Russians asked the Israelis to leave, and when they did not, the Russians shut down the fire control and communication systems of their aircraft." Big suicide bombing in Damascus kills people (who still have no water to drink. ISIS lays siege and Assad gets blamed.) Thanks Eleni. Negotiations regarding the status of Cyprus, between "security-guarantors" Turkey, UK and Greece, with interested-party EU, have been reported as "promising" or "at impasse". They will reconvene Wednesday, 2 days before the change-of-administration in the US. Turkey demands it's army-of-occupation stay. Other parties say "go". "Turkey is demanding that all Turkish Cypriots receive full rights to EU membership., while Greece is pressing for the 30,000 Turkish troops to leave the island over a fixed timetable and for Ankara to end its right to intervene. Turkey has so far refused to make that concession, saying it is “out of the question.” Turkey's President Recep Tayyip Erdogan said troops would remain unless Greece also agreed to withdraw its forces." How Globalists Predict Your Behavior ("know your thoughts", per Google CEO) How free are we in this world of moving parts and watching eyes and centralized recording/correlation of every keystroke and click? The whole system is being continuously adjusted to constrain and predict our every choice. All US deep-state intelligence agencies can share all your information under a broad legal umbrella which was just passed. (Paid any Russian prostitutes to pee on a bed recently? It'll be in there.) "All agencies will have the freedom to dig through “raw signals intelligence information” under the new procedures, which were signed by Attorney General Loretta E. Lynch. After evaluating the information, the agencies can apply rules “minimizing” violations of privacy. That’s correct — only after privacy has been violated can it be protected. That’s not exactly how it works, but it is now the law according to Section 2.3 of Executive Order 12333." UK Labor Leader is accused of "collaborating with Russia" since he wants peace. "Welcome to “everyone I disagree with works for Putin,” the UK version."